Jonathan Henry joined John Deere Limited as a management trainee in July 1993, following an HND in mechanisation, planning and business management at the Scottish Agricultural College, Auchencruive, and a spell in the service department of an agricultural dealership. From late 1993 he worked as an area manager product support (AMPS) in south-west England, and from 1997 to 2001 as a territory manager in the north of England and borders of Scotland. From early 2009, Jonathan held various product marketing roles in Germany and the US, chiefly supporting the launch of the 6R to 8R Series tractors. Since May 2015, he has been planning director for Deere’s global crop harvesting business. 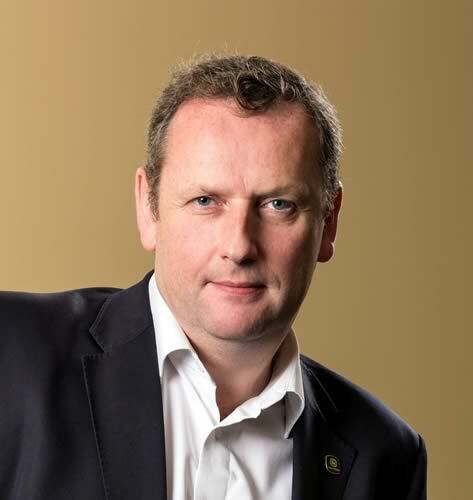 Antony Scott was appointed managing director of John Deere Limited in the UK and Ireland in July 2014, succeeding Richard Johnson. He joined the company in December 1975, also as a management trainee, after obtaining an HND in agriculture at the Royal Agricultural College, Cirencester and an advanced diploma in agricultural engineering at Writtle College. Antony served at Langar in positions of increasing responsibility including territory manager, division credit manager, parts and wholegoods manager, distribution manager and division sales manager. From 2011, he was based in Mannheim as Region 2 (Europe, North Africa, Near & Middle East) dealer development manager, scale and coverage, in which role he was responsible for the region’s Dealer of Tomorrow strategy.